I would rather turn colors of my emotions! I carry them on my sleeve anyway. Flailing arms while walking would be quite a problem for me. I came over here from Delightfully Noted thanks to your guest post today! Love it! I will be trying the Apple Chips out tonight. hahahaha oh my gosh! my favorite one from high school that used to send me into fits of laughter was: Would you rather smell like a fart all the time or have Barbie arms that only rotate at the shoulder? (for me it's a no brainer…Barbie arms! haha) I need to check the closet I keep my games in…I think I have something similar OR I might just see this every time I go to Barnes. Hahaha love this idea. I'm going with the colors. You have to tell us your answer too! I love this game haha! My sisters and brother used to play it all the time. Where in the world can you find the board game? I think I would prefer me skin to change colors. My emotions kind of show anyways... flailing about may be a little weird, especially for my job since I work all over the place and deal with a customer base. hehe sounds like a fun game. HAving my face changing color would be fun. At least when it's black my husband and kids would know what to do. I would rather have my skin change colors... my face makes it hard to hide my feelings as it is, so it wouldn't be much of a change. Flailing my arms would just be embarrasing! Um....love this game. Haha...such a cool new feature. I would so much rather have my skin change colors. Look...a walking rainbow. How rad would that be? Buwahahaha. Love it. I'm goin' with face colors. I'm already one of those people who turn BRIGHT red when I really don't want to. I hate it. I think I would have to say wildly and uncontrollably flail your arms around whenever you walk. I dunno I don't like the idea of changing colors. If your arms are flailing everywhere it could count as exercise. lol, plus if it's only when you walk around, you would have time to rest when sitting down, right? OMG!!! I'm pretty positive that we did this as kids all the time!!! I would totally want to change colors...It would make for some interesting people watching! It would be so cool to take your kids out and play spot that color! Like instead of find a red car...Find a red person! BTW this weekend I made your peach cobbler, yep I had to give most of it away because I would have eaten it all...so delicious and so easy!!! I have this game! So fun. I would definitely rather turn colors for my emotions! I would be so weird flailing wildly all the time. at least when you're happy or something, you'd look normal. LOL! I'm gonna go with flail my arm uncontrollably....it just seems funnier than changing colors...also it might scare some people away that I hate having that Monday chit chat with at work! I love this! I would rather have by skin turn colors that way maybe people would get the hint when I cannot tolerate stupid at all on one day. You aren't the only one that gets ignored when it comes to playing games! I would prefer changing color. Then people would know what I'm feeling. I've been known to have a face that people can't read too well sometimes, so added color should work, spot on! It would prove interesting figuring out what to wear for the day! I love this game, but it stresses me out a little. Like the choices are real or something! I think I would rather change colors. Tough one...does everyone else change color too... Argh tough decisions! I'd rather my skin change! Hahaha probably the color changes for me. I think it would be scarier to see me flail my arms haha. this game is so much fun! i choose the skin changing, because i already can't hide my emotions very well. :) it wouldn't be a huge departure for me! I'd rather glow up in all kinds of colors. I bet I would loe it, since my emotions change all the time. I'd be a wlaking and talking rainbow, hah! LOL, I love this game!! Hilarious. I'd much rather have my skin change vibrant colors per emotion. Hahaha! My answer... turning colors. While it would be horribly inconvenient, it would also be good if my husband could actually see my emotion. He could come home and be like, "Oh gosh, she's mad... time to take the baby, clean the kitchen, and send her off to her office with a few hours of uninterrupted crafting time." ;) At least... that would be my fantasy world. I have never played or heard of this game but I would love to play it. I have cranium and it is still brand new because I can never find anyone who is willing to play with me. I would rather wildly and uncontrollably flail my arms around whenever I walk to keep people away from me and if I were to hit them with my uncontrollable arms it would not be my fault. LOL. 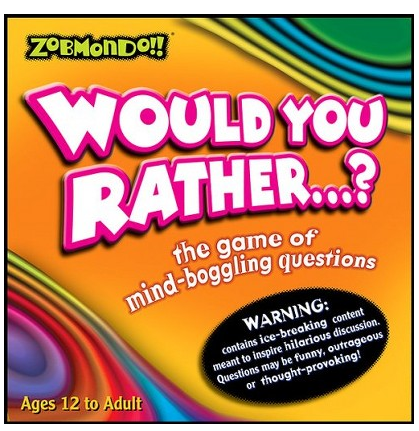 I love "Would You Rathers," they are so funny. I would definitely pick the changing colors with your mood, like a mood ring. That way when you're mad, people would just leave you alone. Sounds way better than flailing my arms around. I love this game! Such a cool idea for a blog! I'd rather have my skin show emotions! You'd never need to by a mood ring again! hahahah OH my gosh, what a choice! I love this game too! Our radio station here in town does Would you Rather Wednesdays. I think I might have to adopt this game for my blog on Wednesdays too. It's SO FUN. Can you tell I'm avoiding your question? haha...Ok, I think I'd rather have my arms flail uncontrollably b/c it would be embarrassing to be such an open book about my emotional state ALL the time. hehe...Great post! I love questions like that! So fun! I'd like to change color!